Life, they say, isn’t a track meet. It’s a marathon. Or maybe, life is a highway — aaaaand we just put that song in your head. Sorry. Whatever your racing analogy, dress appropriately. 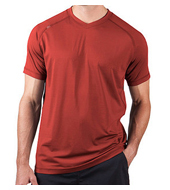 Ergo: Rhone Apparel, selling high-end athletic wares now. Rhones’s athletic shirts, shorts and pants are constructed, in part, from AG47 military tech, a fancy bit of gobbledygook that means silver threading that kills sweat bacteria, initially developed by the military for soldiers in Iraq. The details are nice: A media pocket on the shorts. Mesh panels for venting. Silicon gel on the drawstring to keep things tied nicely. And, for added testosterone: each pair is named after manly-man cultural icons from Fight Club (the Durden shirt), Gladiator (Meridius long sleeves) and Bullitt (er, Bullitt shorts).